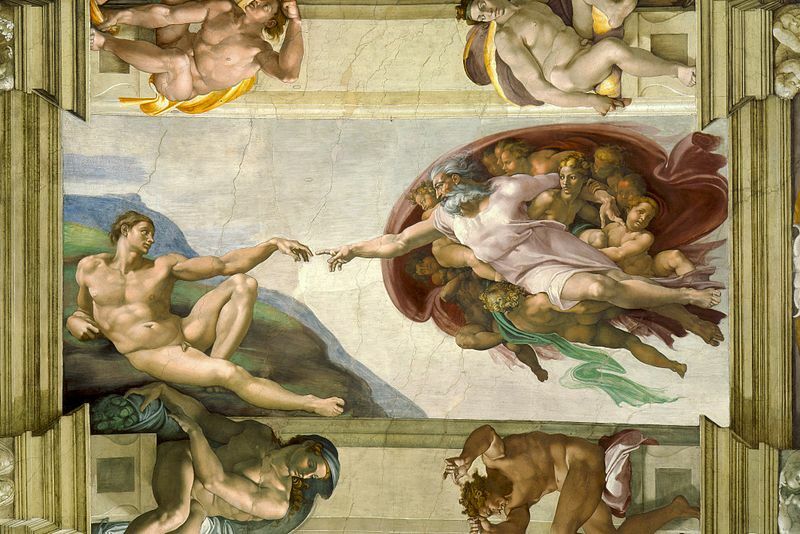 The subject of Michelangelo's "The Creation of Adam" came up in art class the other night. Several hypotheses have been put forward about the meaning of The Creation of Adam's highly original composition, many of them taking Michelangelo's well-documented expertise in human anatomy as their starting point. In 1990 Frank Lynn Meshberger, M.D. noted in the medical publication the Journal of the American Medical Association that the background figures and shapes portrayed behind the figure of God appeared to be an anatomically accurate picture of the human brain. On close examination, borders in the painting correlate with major sulci of the cerebrum in the inner and outer surface of the brain, the brain stem, the frontal lobe, the basilar artery, the pituitary gland and the optic chiasm. Meshberger also argues that there appears to be communication present despite the gap between the depicted Adam and God, just as neurons transmit biochemical information across synaptic clefts. Further, below the right arm of God, the painting shows a sad angel in an area of the brain that is sometimes activated on PET scans when someone experiences a sad thought. God is superimposed over the limbic system, the emotional center of the brain and possibly the anatomical counterpart of the human soul. God's right arm extends to the prefrontal cortex, the most creative and most uniquely human region of the brain. Alternatively, it has been observed that the red cloth around God has the shape of a human uterus (one art historian has called it a "uterine mantle"), and that the scarf hanging out, coloured green, could be a newly cut umbilical cord. "This is an interesting hypothesis that presents the Creation scene as an idealised representation of the physical birth of man. It explains the navel that appears on Adam, which is at first perplexing because he was created, not born of a woman."